It was a beautiful sunny December morning, when I had my first heart to heart chat with Devi, Namuna, Elisa, Elija, Akash, Kumar, Sameer, and others. This was my first interaction with the beggar kids from the Pashupati Temple area and I realized that each of them had an identity and a distinct personality. Their lives and their stories shocked me and I was convinced that Bollywood films were not just imaginary concepts but based on real lives. For all these children ranging between 4 to 14 begging, beating, stealing and drug addiction were ways of survival. "Survival of the fittest" is still very much a valid concept in their lives. And I don’t blame the kids, they sleep under the open sky when the temperature is hovering around zero degrees. They go hungry for 15-18 hours at a stretch if they miss the food being distributed by Annapurna Bhandar. 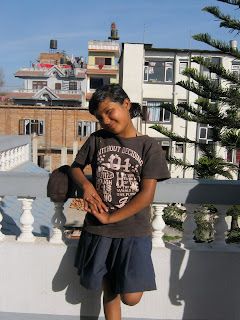 Elisa is 8yrs old, lives on the pavements along with her other siblings and begs for a living. She also collects some left over coins from the funeral pyres after the last rites are performed as per the hindu rituals. If lucky she even finds a piece of gold, which she sells to other petty thieves or drug peddlers. But what really sets Elisa apart from other kids in the begging community is that she is convinced that if she goes to school her life can change dramatically. We opened our hearts to Elisa and her friends and welcomed them to Koseli. Every morning Krishna (our teacher) would go to Pashupati Temple area in search for our 10 chosen kids and bring them to school. It obviously wasn’t easy for him. Elisa played the role of the lead spotter in Krishna’s search. Initially the routine of the kids was kind of weird. 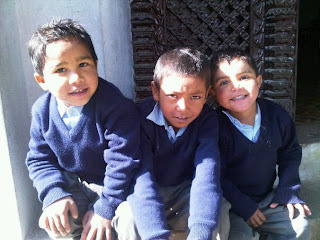 They would come to the school eat, sleep, bathe and then again eat and sleep. It was heart wrenching to see how their lives revolved around food and now that they had access to 3 full meals a day, they wanted to make up for all the past years. On a yet another lazy sunny morning, they even shared my lunch after finishing theirs. For me, it was the best meal of my life. Gradually things changed and they started showing interest in studies and soon, as per their grasping levels they were assigned classes. Now they follow the same routine as other kids at Koseli. Elisa along with her three more friends has not only been coming to school regularly but has also given up sniffing glue. She is a very cheerful and bubbly child and looks very different from the girl with matted hair and ragged clothes we first met. Our best wishes are with her and her friends. However we have not been so lucky with Devi, Namuna and others. They were deep into addiction and no amount of luring them to basic comforts of life, Koseli could not hold them. These kids now just vanish into the thin air when Krishna does his daily rounds in Temple area. Nevertheless, we are very happy because even if it is four lives that we have been able to transform, we feel it was worth all the effort. After all it is human life we are talking about. We are on our way to successfully integrating Elisa and her three friends in the Koseli family. As of now we are operating full capacity and don’t know what to do about the 40 kids on the wait list. great initiative, heart touching. thanks a ton for changing their lives. I hope you get your wish and have 100 schools.